It's 1918, and we have ourselves a wonderful automobile, or motorcar, as I prefer to call it. My pappy still insists on calling it a "horseless carriage", but he needs to get with the times! We're driving east in the California desert with Phoenix, Arizona as our destination. We're moving right along, we must be averaging over twenty miles an hour! We'll be at the river soon. And yes, I know that the only bridges across the Colorado River are for trains, but I have a plan. We're going to cross at at the Parker Cut-Off. All right, I see the river ahead of me. 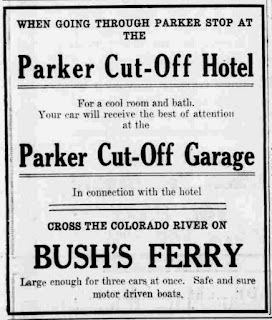 We're looking for something called "Bush's Ferry", but it shouldn't be too hard to find. And Parker is just across the river, in Arizona. OK, we're across. No waiting! They take three cars across at a time! Now we're in Parker. Look! 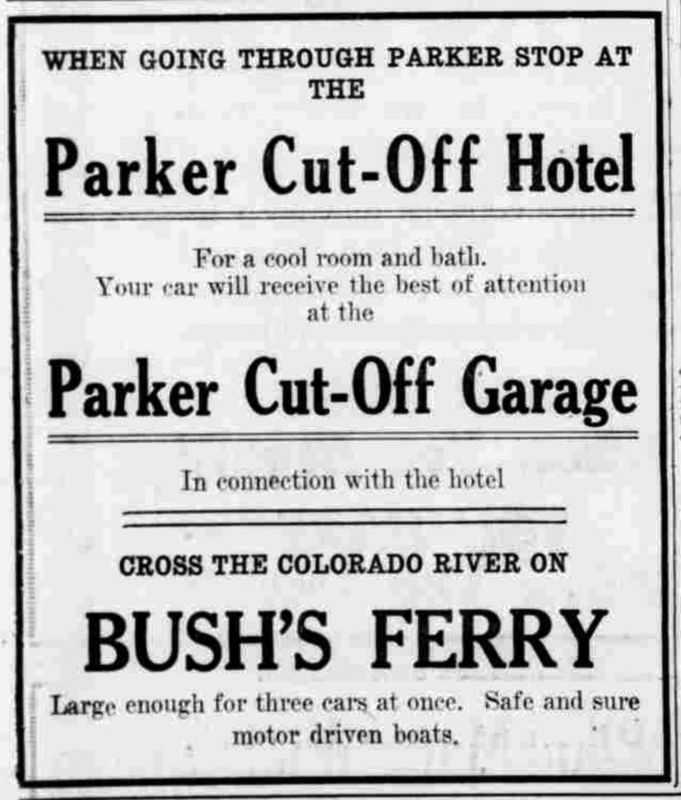 There's the Parker Cut-Off Hotel. I don't know about you, but I could use a cool room and a bath. And the Parker Cut-Off Garage is right nearby so we can get some fresh tires and whatever else old Isabelle needs. Good morning! And it's a beautiful morning to be in Arizona, so let's get going. We're going to pass through Denny, Linskey, and Bouse. Wow, Bouse is really booming! Maybe I should suggest to my dad that he invest there. Almost to Utting, next stop Vicksburg, and then Salome. Yes, where she danced, like in the Bible! I think you should drive for a while. There's Wenden, Cullens Well, and Aguila. We're almost to Wickenburg! We need to stop there and see if we can pick up some chunks of gold in the street, that's what I've heard. Although I've also heard that if you drink from the Hassaympa River you'll never tell the truth again. Doesn't worry me! Some wide open spaces! We're going through Marinette, and I see a lot of cotton growing there, must be the Goodyear company. Peoria, Glendale, Alhambra, and we're almost to Phoenix, we'll be there in just a few minutes! I'm sure that we can buy new tires there. Thank you for riding along with me!